I'm a stickler when it comes to clutter. I really do not like it. Being claustrophobic doesn't help either. Basically, I feel it's just not necessary to have so much junk just lying around. If you have to have it, isn't it better to have most of it stored away neatly? With living spaces rather small these days, making the most of storage space is a great trick to master. Messy areas are not confined to hallways and entrances, or basements; they're everywhere. 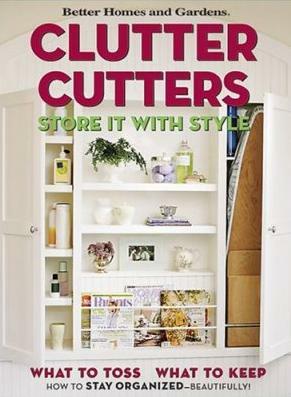 In this book you'll find great ideas on how to re-organize your existing rooms and whether you throw out stuff or not. I love the idea of a mud room, and just loved the storage ideas on pages 16 and 18. Personally, I prefer storage inside a cupboard and against a wall. I feel that moveable or modular cabinets with drawers just add to the cluttered look. I adore bookcases and am constantly on the lookout for practical yet pretty ideas. I did like the one on page 33 (top right) which I could envisage in four corners. I also liked the functional one on page 35 - great use of space. The kid's bedroom on page 64 is just beautiful. I hated the closet on pages 72/73 - looked too much like a store, and this person has too much! The home office is something more homes are acquiring - check the ideas out in this book. My favorite tip is on page 144 about the plastic grocery bags - yes! It's not a crime or a sin to throw out old stuff. Toss the junk. You'll be amazed at how different you feel after a good cleanout. Take an indepth look at the "before" and "after" pictures! Conclusion - Not only how to declutter, but also fab decorating ideas.